This church of white marble and granite, vast and grand, defies description. It’s new (construction started in the 20th century), and still incomplete, though you won’t be able to tell that at a casual glance. The architecture is Serbian-Byzantine. It was thought that in 1595, the Sinan-Pasha burned the relics of Saint Sava here, but this has since been proven inaccurate. The church can hold 10000 people at a time. Its polyphonic bells sound every hour. On the inside though, it’s not so impressive. You’re better off clicking pictures from the outside. Once it IS finished on the inside though, it’ll join the ranks of the greatest churches in the world. If you come in the evening, after the sun has gone down, you’ll see the church looking magically lit up. It’s a sight worth coming for. How popular is St. Sava Temple? 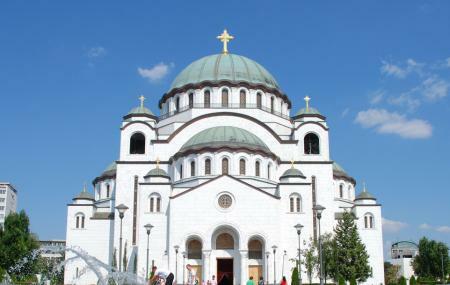 People normally club together Crkva Svetog Marka and Nikola Tesla Museum while planning their visit to St. Sava Temple. Amazing construction. We saw in of course non finished because it is still under construction but all this gold color and the amazing architecture makes you wanna stay in this place for ever... You feel the energy flowing in you you have this feeling of faith because all this construction made for God's glory, everybody there is working with love to achieve this masterpiece... Put with love rock over rock to build this place! It's another nice church... I think I may have just seen too many churches this trip and so now they are all same. This one is unfinished and the basement crypt is particularly interesting, more ornate and decorative than most. Worth taking the time to go inside. The second biggest orthodox cathedral after helsinki. Nice outside architecture. As of April 2019 main area is closed for renovation so only crypt is visitable. There are very classy and posh restaurants around the cathedral. Very good to see, you can see a rather new(almost like newly opened)but historic church. Construction work still in progress. Beware of pick pockets!